Allahabad Bank customers can now apply for Debit card online through mobile banking and Net Banking. Allahabad Bank ATM card apply facility now available online. If you blocked your current Debit card or want a new ATM Debit card or want to upgrade your card then no need to visit, just log in to Allahabad Mobile Banking or net banking and request a new Debit card. 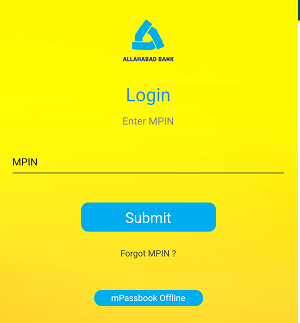 Step 1: Login to Empower Mobile Banking application by entering your login MPIN. Step 2: After login, tap on More option and then in the Card Request section, tap on Debit Card Request. You can also use Allahabad Net banking to apply for a new ATM card. 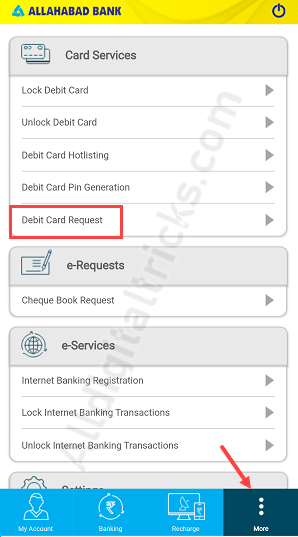 (2) After login, click on ATM Services – Debit Card Request. 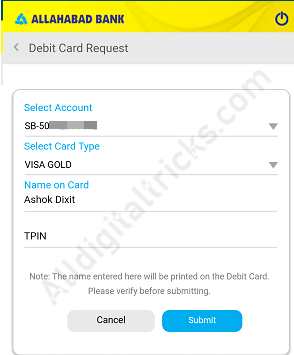 Now select account number, select card type and enter your name. Enter transaction password and submit your request. Done! your Allahabad Bank Debit card request submitted successfully. Your new ATM Debit card will be delivered on your registered mail address within 10 working days. (1) Can I apply without mobile banking? Answer: No, first register for mobile banking. Install emPower application and complete one-time registration. (2) What about Annual charges? Answer: Depend on your card type, bank charges you Rs.100 to Rs.300 annual fee. (3) Can I keep my current card active? Answer: No, to apply for a new Debit card, first block your current card. (4) Can I Apply for International Debit card? Answer: Allahabad Bank also offers International Debit card, so yes you can. (5) How to activate my new card? Answer: You will receive a physical PIN, just visit any ATM and withdraw some cash. You can also generate your card pin online. (6) Which Debit Card offered by the Bank? Answer: Currently Bank offers Rupay classic Domestic, Rupay platinum International, VISA Gold, VISA International EMV and VISA Platinum Debit cards. 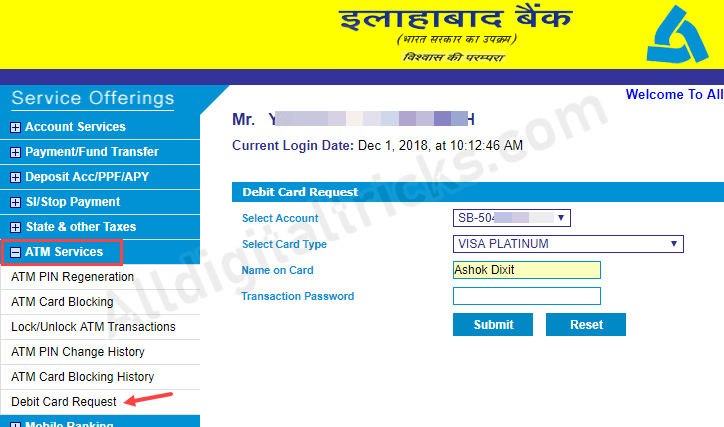 Allahabad Bank ATM Debit Card apply online facility available for all customers through mobile banking, no need to visit Bank.